Starting with Raven’s Run in 2014, my romantic pairing of Raven and Josie have been fighting to save America against the odds. The Raven’s series has been popular. I am now working on book #4. Book #3 — Raven’s Resurrection — saw my characters fighting, using heavy military weapons, to suppress and eradicate an IRANIAN QUDS BASE in a sanctuary state right here in America. We live in a polarized world. Some love my novels, some hate them, and others have censored (even blacklisted) them. With that said, there is so much confusion and disinformation in the news and social media that few fully understand today’s complex, multi-faceted, threats. Well, technically, not quite. So far, I’ve not spoken to that. Just to be noticed is the best one can hope as a novelist. It would be inappropriate, foolish, to quibble with my fans or foes about what my novels say. My books say what they say. Novels are subjective art. Raven’s team has encountered many dangerous adversaries along the way (some internal), but their primary enemy, and America’s primary enemy, throughout all the Raven’s books has always been the IRGC, Iran’s Islamic Revolutionary Guard Corps. Experts all over the world have long worried about IRGC, but ruled they were not terrorists. I can now say, with credible citations, that the primary enemy group that has been seeking to destroy Raven and his small band in my novels in the past wasn’t a collection of terrorists. Raven’s enemies were legally protected. Much of the world sought to keep it that way, including some officials in our own Military, State Department, and Intel community. All that changed on April 8, 2019. The Trump administration disagreed. Like Harry Porter facing Voldemort, President Trump and Secretary of State Pompeo deemed it important to correctly name America’s primary enemy. IRGC (and its sub-group QUDs) is a component of Iran’s military. Until now that has protected them. No longer. President Trump has officially designated IRGC as a TERRORIST ORGANIZATION. This marks the first time in history that an element of a foreign state has been officially designated a terrorist entity. IRGC and all its myriad components are terrorists now. It has been named. IRGC stands exposed, stripped of legal and diplomatic protection. It can now be targeted and destroyed. My readers will see more of IRGC in my next novel. National security adviser John Bolton and Secretary of State Mike Pompeo have been strong proponents of the move, which is intended to help the U.S. crack down on businesses in Europe and elsewhere controlled by the IRGC, the officials said. But Pentagon officials, including Marine Gen. Joe Dunford, the chairman of the Joint Chiefs of Staff, have cautioned against the move, several U.S. officials said, fearing it could lead to a backlash against U.S. forces in the region without inflicting the intended damage to the Iranian economy. Central Intelligence Agency officials have also had reservations about consequences of the decision, the officials said. The U.S. Central Command, which oversees U.S. forces in the Middle East, is planning to issue a regional alert to U.S. troops in the coming days, a precaution in case the move spurs Iran or the Shiite militias it supports within the region to retaliate, a defense official said. Spokesmen for Gen. Dunford, the CIA and the U.S. Central Command declined to comment. Jason Blazakis, who served until last year as director of the State Department’s Counterterrorism Finance and Designations Office, said the designation would have major implications. “The designation of IRGC as a Foreign Terrorist Organization is precedent setting. Never before has the FTO sanctions tool been directed at a state-body. The future ramifications of this decision will be profound,” said Mr. Blazakis, now a professor at Middlebury Institute of International Studies at Monterey. President Trump has taken a hard-line on Iran and is considered to be strongly supportive of the new initiative, the officials said. But with numerous legal complexities, concerns about how the policy might be carried out were being raised with the administration as late as Friday, the official said. Officials with Iran’s United Nations mission in New York didn’t immediately respond to a request for comment. The Trump administration has long had its sights on the IRGC, a component of Iran’s military forces which is fiercely loyal to the Iranian government and has amassed vast economic power in Iran in recent decades. The IRGC’s Quds Force, a specialized division, has arranged weapons deliveries and advised pro-Iranian militias in Syria, Iraq and elsewhere in the Middle East. The Corps has been involved in Iran’s nuclear program and has played a role in cracking down on dissent at home. It has also played an important role in Iran’s economy. As CIA director in 2017, Mr. Pompeo said companies overseen by the IRGC might control 20% of the nation’s economy, including important sectors like energy. 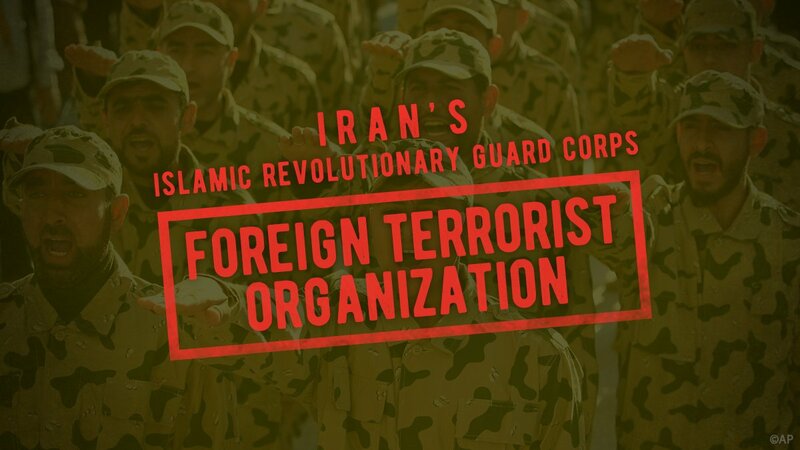 While the U.S. Treasury Department has already taken some steps against the organization, formally designating the IRGC as a foreign terrorist organization would greatly expand the U.S. ability to act against the group and those companies and individuals that do business with them. Under the designation, companies and individuals are banned from providing any type of material support or resources to an IRGC-controlled company or to IRGC officials, such as financial services, training equipment, expert advice, weapons or transportation. Corps officials and those who deal with them would be subject to civil or criminal penalties, including prosecution. The designation also would block any foreign representatives of the IRGC or the companies it controls from entering or staying in the U.S. The larger goal for administration proponents of the designation is to dissuade international companies from doing business in key sectors of Iran’s economy where the IRGC has significant influence, even as the precise ownership of an Iranian firms may be obscure. Though the designation could be revoked by a future administration, doing so might be a difficult political step without evidence that the IRGC is not linked to terrorism or supporting militant groups in the Middle East, as the U.S. has alleged. Opponents of the move say it may not be decisive in weakening Iran due to the IRGC’s persistent efforts to camouflage its ownership of other entities. Designating a major element of Iran’s military forces as a terrorist organization, the opponents add, also would set a precedent that the Washington’s adversaries may now draw on by applying the label to elements of U.S. armed forces. The Obama administration considered but never took the step of designating the IRGC as a terrorist group. “New leadership has decided to look at things differently,” the official said. Iran is looming as a major foreign policy issue in the 2020 U.S. presidential election, with some Democratic candidates pledging to return to the 2015 nuclear accord with Tehran, from which Mr. Trump withdrew last year, though possibly with some adjustments. In withdrawing from the pact last year, the Trump administration outlined 12 demands that would require a wholesale change in Iran’s military posture in the Middle East. Those demands include the requirement that Iran give up its right to enrich uranium, which it retained under the 2015 agreement; cease its support for militant groups like Hamas; and stop issuing threats against Israel. Iran’s leaders have said they have no interest in negotiating with the Trump administration on the demands. While sanctions the U.S. has imposed have hurt the Iranian economy and put strains on the regime’s budget, they have not led Tehran to pull back from its military role in Syria in support of President Bashar al-Assad or scale back its paramilitary role in the region. This entry was posted in Actionable, Constitution & Gov, Military, Non-Fiction, Novels and tagged Dark Side, Deep State, Educational, Exceptionalism, Freedom, Terrorism, Tyranny. Bookmark the permalink. Michael McCaul (Chairman of chairman of the U.S. House Committee on Homeland Security) says Iran to blame for more than 1,000 U.S. casualties in Iraq, plot to attack D.C.
During an April 2019 press briefing at the State Department, Brian Hook, U.S. special envoy to Iran, revealed “based on declassified U.S. military reports, that Iran is responsible for the deaths of at least 608 American service members” throughout the course of the Iraq War. Hook claimed that “this accounts for 17 percent of all deaths of U.S. personnel in Iraq from 2003 to 2011” and did not take into account “the many thousands of Iraqis killed” by Shiite Muslim militias allegedly trained by Iran’s elite Revolutionary Guards. It seems that the Obama Administration may have concealed the number of our Vets wounded in Iraq and Afghanistan. VA stopped preparing and releasing these reports on health care use and disability claims involving the 2.6 million U.S. service members who have been deployed to Iraq and Afghanistan without warning, claiming unspecified “security” reasons. Useful note about Iran policy. IRGC is in charge of Nuclear Weapons and Ballistic Missiles for Iran. There are more dangerous threats to America than plastic straws or farting cows. Raven’s Run features a plot line of terrorists with EMP weapons. The science behind this is real. Remember those ship-based missiles in my novel Raven’s Run? Well, turns out they are here. In America. In our American ports. Russian Club-K systems. Here is more about IRGC deploying Ballistic Missiles against the civilian populations of advanced states. Trump’s EO comes none too late. One hopes other Western Nations (forget Fake News, the UN, or the EU, those are hopeless) wake up.